Cyclopes didactylus reproduces sexually as it forms embryos like the yak. In Cyclopes didactylus, the uterus of C. didactylus is pear shaped and has fallopian tubes that are connected to flattened ovaries (Hayssen et al 2012). Gestation of the fetus is around 135 days and only one offspring is produced (Schober 1999). The mating seasons for C. didactylus is from July to August (International Masters Publishers 1993). Cyclopes didactylus has one cub per pregnancy and it can have two pregnancies in a year (Hayssen et al 2012). The cub is born with fur and is reared by both parents. 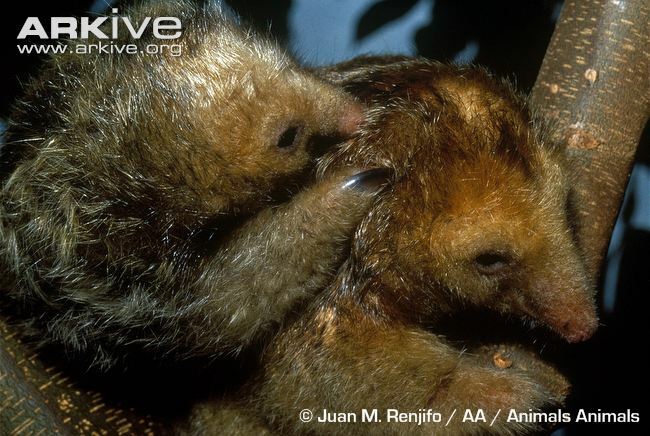 When C. didactylus gets to about one third the size of the parents, they feed it partially digested insects and the males sometimes carry it on their back to and from their nest of dry leaves in a hole in the tree (Schober 1999). While on its parents' backs, the cub clings onto their tail so it does not fall off of their back (International Masters Publishers 1993). Foraging mothers leave the cub in the nest for about eight hours each night to get food (Hayssen et al 2012). The offspring is weaned off of its parents support when it is about one half to two thirds the maternal weight (Hayssen et al 2012). This happens at about nine months old and the cub becomes semi-independent, slowly moving from its mother (International Masters Publishers 1993). The offspring usually lives for about 2.3 years on average in captivity (Schober 1999). Keep on going! Interactions is next!